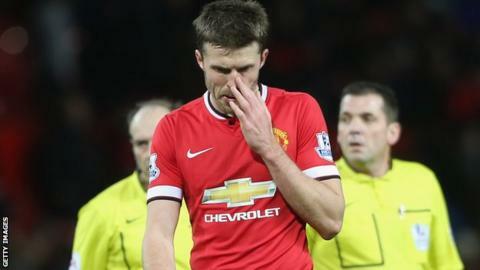 Manchester United midfielder Michael Carrick will be out for around four weeks with a ruptured muscle. The 33-year-old, who has made 14 appearances this season, has been ruled out until late February by manager Louis van Gaal. United's boss also says he will not be signing anyone before the transfer window closes on Monday. "Every day I read that I am interested in players. I am not interested in players, only selling," he said. Carrick's injury is the third he has sustained this season. The United vice-captain suffered ankle ligament damage in July that ruled him out until November, then picked up a minor groin injury shortly after his comeback. Van Gaal, though, says that winger Ashley Young is getting closer to full fitness after almost a month out with a hamstring injury. Young was ruled out for several weeks after picking up the injury during the 1-1 Premier League draw at Stoke on 1 January.